Kamehameha III (born Kauikeaouli) (March 17, 1814 – December 15, 1854) was the third king of the Kingdom of Hawaii from 1825 to 1854. His full Hawaiian name was Keaweaweʻula Kīwalaʻō Kauikeaouli Kaleiopapa and then lengthened to Keaweaweʻula Kīwalaʻō Kauikeaouli Kaleiopapa Kalani Waiakua Kalanikau Iokikilo Kīwalaʻō i ke kapu Kamehameha when he ascended the throne. 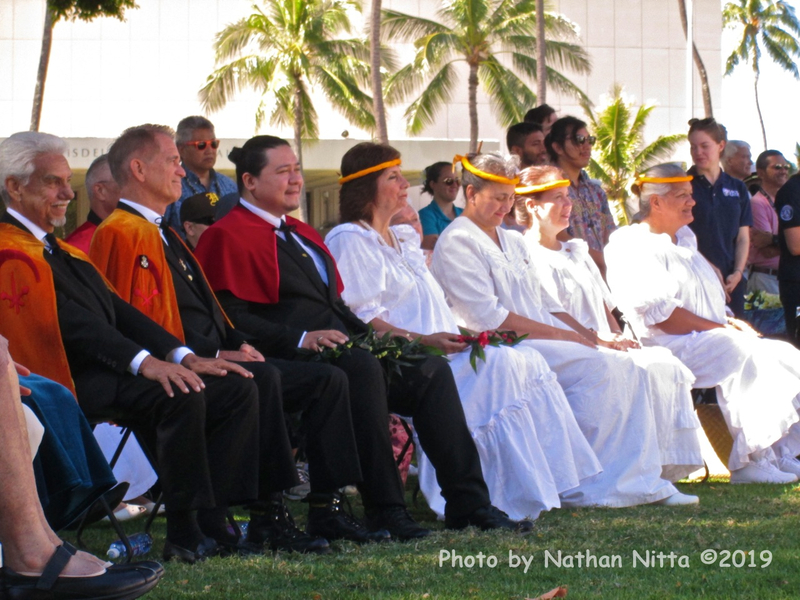 Under his reign Hawaii evolved from an absolute monarchy to a constitutional monarchy with the signing of both the 1840 Constitution, which was the first Hawaiian Language Constitution, and the 1852 Constitution. 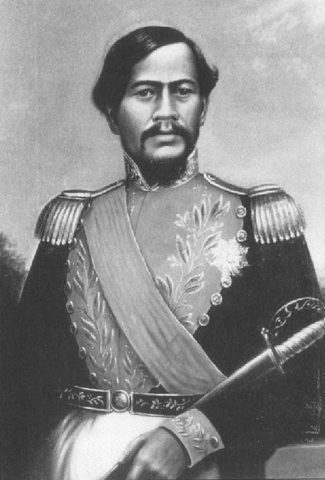 He was the longest reigning monarch in the history of the Kingdom, ruling for 29 years and 192 days, although in the early part of his reign he was under a regency by Queen Kaʻahumanu and later by Kaʻahumanu II. His goal was the careful balancing of modernization by adopting Western ways, while keeping his nation intact. 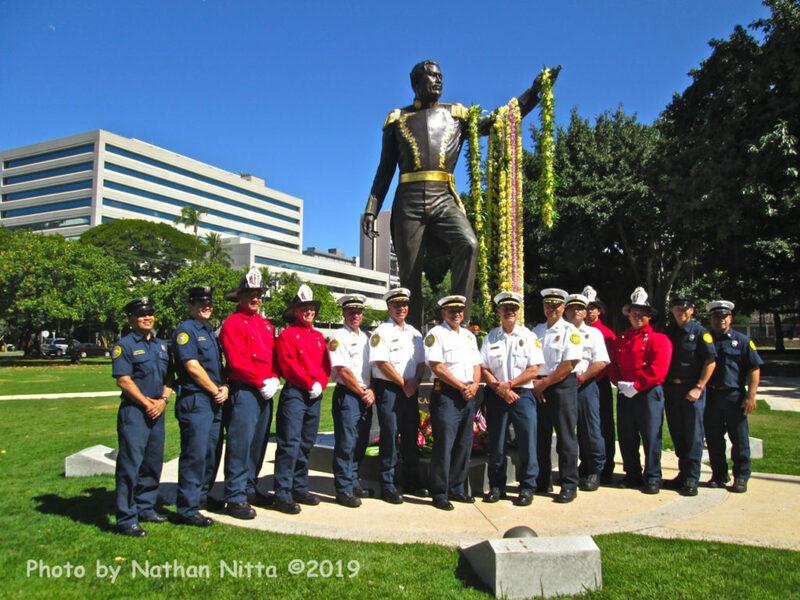 Thomas Square is significant to Hawaii’s history being the location where the British government relinquished a short occupation of the kingdom back to its rightful entity. 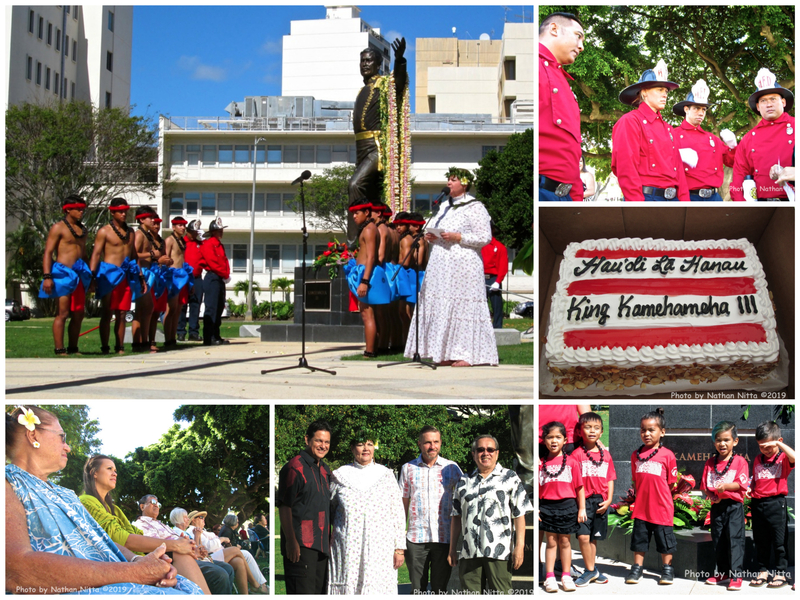 A flag ceremony was held in the location of Thomas Square in 1843 between British officials and King Kamehameha III. 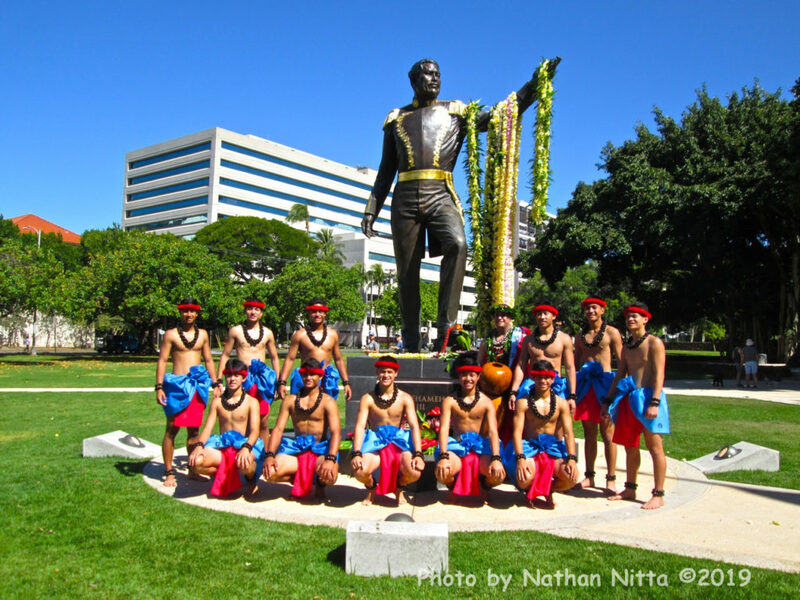 With its recent renovation, Thomas Square is now a landscaped park where residents can enjoy passive relaxation and small gatherings in a green area dominated not only by Kamehameha’s statue, but also a large banyan tree and a memorial fountain donated to the city by the Outdoor Circle in 1932. Before the renovation, the park had a somewhat checkered recent history having for several months being an encampment for the De Occupy Honolulu movement in 2011. Homeless people have also set up illegal encampments in the park at times. Thomas Square is on the National Register of Historic Places. 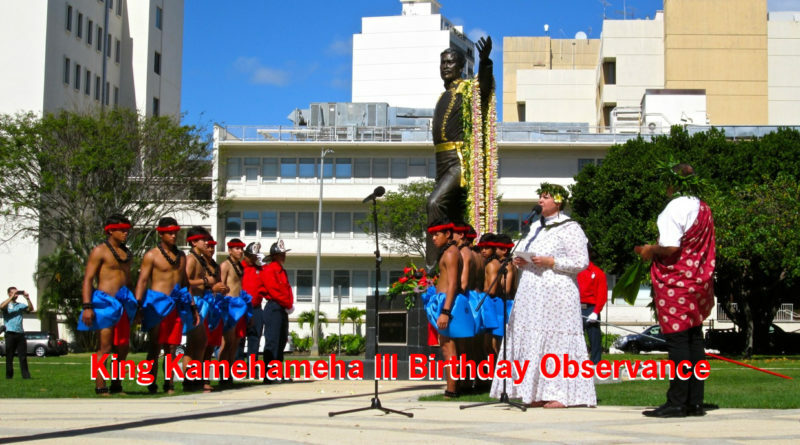 Yesterday’s birthday observance was the first ever for Kamehameha III. It will probably become a new annual tradition. Honolulu Fire Department personnel helped drape the lei over the arm of Kamehameha III’s statue (above). 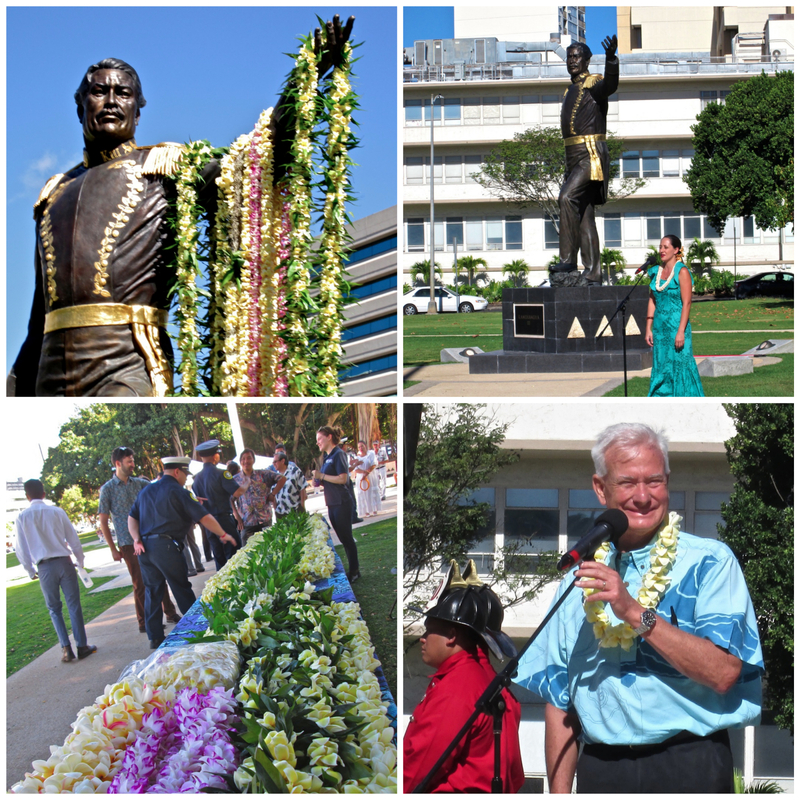 Several groups participated in the birthday ceremony complete with several music, speeches, birthday cakes and flower leis. The hula halau dancers after the ceremony was over. Mayor Kirk Caldwell (bottom right frame) spoke briefly at the ceremony.